A ramp is a simple and affordable way to increase mobility and accessibility. Whether you need a way to smoothly transition over thresholds in your home or you want to install a modular ramp to allow easy access to your business, we have the solution for you. 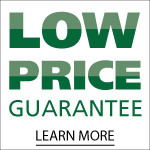 All of our ramps are ADA compliant and backed by our 110% Low Price Guarantee. Want to learn more about which ramp is right for you? Contact one of our experts at US Medical Supplies of Lexington today. Be sure to ask them about our next day shipping service and find out whether your purchase qualifies for free shipping.